It may be January, but it feels like March. The whole country is warm and the weather map glows of yellow and orange. There are hardly any areas of frigid blue. And not a rain cloud in sight. While that means that our snow skis are standing sad and neglected in the garage, next to the dusty snow tires and bins of winter gear, it also means that I can walk outside to blue skies and feel the warmth of the sun on my bare arms. By nightfall, cooler temperatures return with the fog, and its time to get cozy with sweaters and fuzzy slippers again. It is definitely concerning , the current lack of rain. Here in Northern California, we are usually drenched this time of year, but we know the earth needs it to survive the dry summer months. But I have to admit that I am really loving this sneak peek into spring. With the holidays behind us and the mild weather tapping our backs, I instinctually move away from the heavy foods of winter, craving lightness and bright flavors instead. But I still seek richness and succulence. 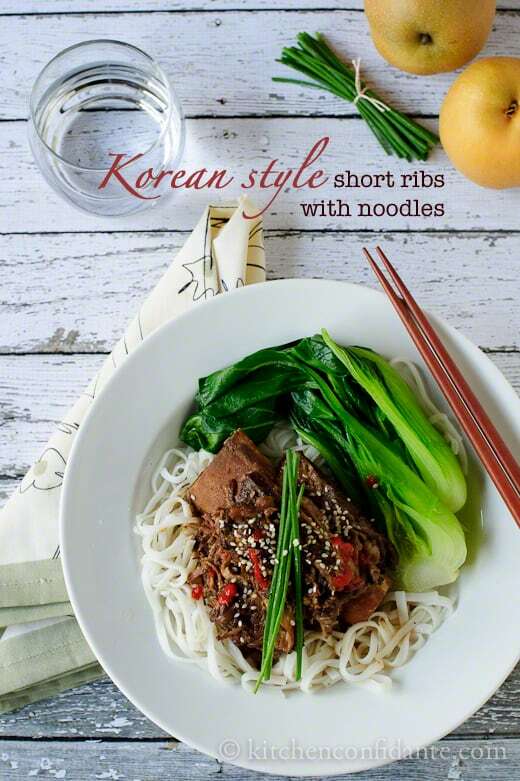 Slow Cooked Korean-style Short Ribs with Noodles are the perfect compromise. When it’s too brisk to grill, the slow cooker takes the time to work its magic on plump beef short ribs. Rather than marinating, let the ribs slowly cook to shredded perfection in the salty sweet bath. But the secret surprise is the Asian pear. It lends freshness and sweetness to the sauce, and aids in tenderizing the beef. 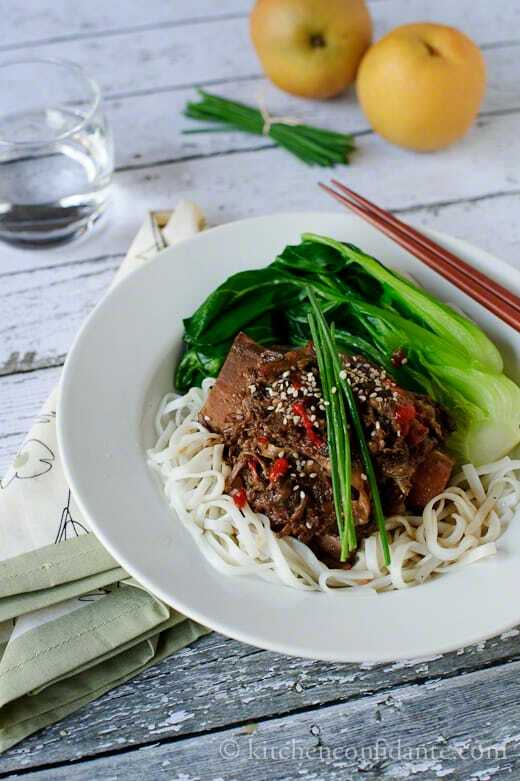 Served on a plate of slippery rice noodles with some baby bok choy for balance and fiery chili sauce drizzled on top, you will find yourself slurping up the morsels of beef in the sauce-drenched noodles with a happy heart. At least I know I did. Once in a while, there are some dishes that I just want to scream: you must make this. This is one of them. Please, go. Go make this. I know you won't be disappointed. If you don't have a slow cooker, don't worry! You can braise the short ribs in a Dutch oven or a heavy pot. See cooking notes below. 1. In the bowl of a food processor, combine the pear, scallions, and garlic, and finely chop. Add the water, soy sauce, sugar and vinegar and blend. 2. Place the short ribs in the bottom of a slow cooker and cover with the processed mixture. Let it cook for 4 hours on high or 8 hours on low, turning the meat twice during the cooking process. The short ribs will be done when it is falling off the bones and very tender. Strain the sauce and skim any fat. 3. Bring a pot of water to a boil and cook the noodles for about 8 minutes, or as instructed by package. Drain and set aside. Blanch or steam the bok choy until just tender and place in an ice bath to stop the cooking process and keep the stalks crisp and bright green. 4. 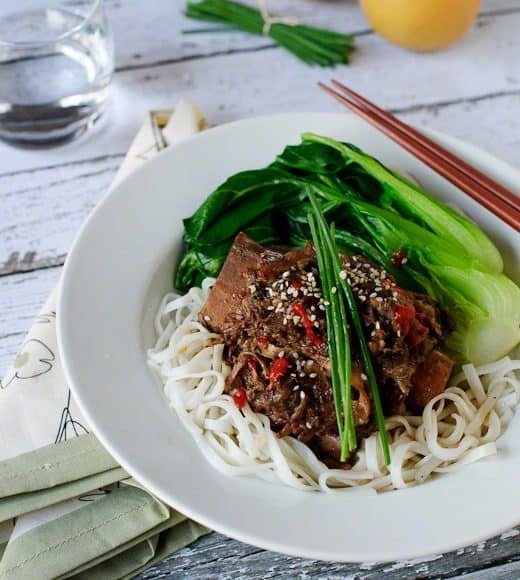 To serve, place short ribs on a bed of rice noodles along with some bok choy and ladle the sauce over the ribs and noodles. Garnish with sesame seeds, chives and hot chili sauce if desired. Serve immediately. 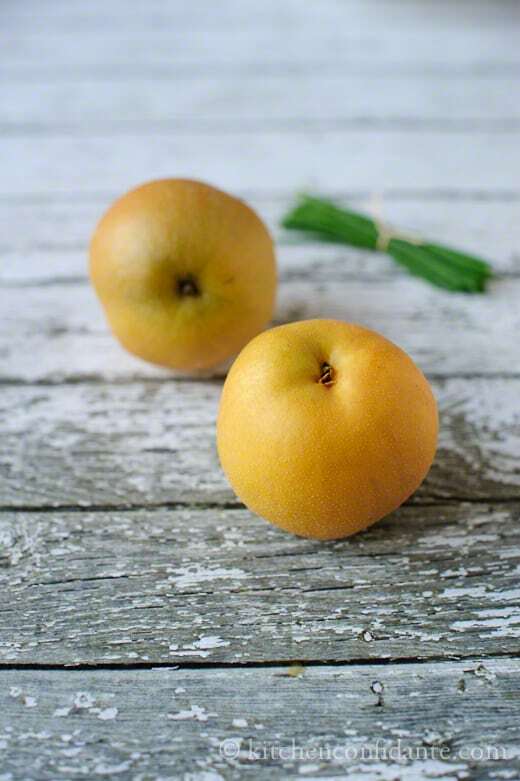 * If you can not find an Asian pear, any pear variety will work. I have also made this with Comice pear, and it worked beautifully. Place an ovenproof casserole or Dutch oven over medium heat. Add vegetable oil, and heat until it is very hot but not yet smoking. Season short ribs lightly with salt and pepper. Add short ribs to the pot, working in batches if necessary (take care not to let the short ribs touch – you run the risk of them steaming rather than browning). Cook ribs until browned. Do not rush! Remove any excess fat. Pour the blended liquid over the ribs carefully; stir with wooden spoon until all browned bits have been scraped from the pan and the bottom of the casserole is clean. Bring it to a simmer over medium high heat. Cover the casserole, and place it in the oven. Cook until ribs are very tender, about 3 hours. Strain the sauce and skim any fat. Continue recipe with Step 3. Adapted from Korean Beef Barbecue, Weber's Way to Grill by Jamie Purviance (Weber-Stephen Products Co., 2008). The original recipe was intended as a marinade for grilling, but it was amazing in the slow cooker. Yup, this one is a must-make. Keep the slow cooker recipes coming! I think I need to add slow cooker to the appliances in my kitchen! I highly recommend getting a slow cooker! I just got mine and already, it has proven very useful. But you don’t need one to enjoy this dish. I’ve added notes so you can make it without one. No worries! I did not have a slow cooker until just recently. I added instructions so you can braise the ribs the regular way…enjoy! That’s simply a bowl of treasures! Ohhh I want to try this in the slow cooker. I love the idea of adding asian pear to it too. This looks amazing- love the top photo too! I love using my slow cooker. That looks absolutely delish. I’m making it this week… definitely. Thanks! These look wonderful! It’s been an unusually warm winter for us so far (aside from a brief deep-freeze that blew in from the arctic for a day or two, that is), but that’s not stopping me from making my favourite winter dishes anyways… I see a big pot of these short ribs somewhere in my near future! These look ridiculously good! Slow cookers are miracle workers! I love working with short ribs. They have so much flavor. This recipe looks delish! I will, I will make this. I have not used my slow cooker in 4 years. The bok choi is perfect. What a wonderful dish to ring in the New Year! I am happy to have more time on my hands…hopefully it means I can create something just as delicious as this in the week ahead. Many blessings and much love from Austin. Thank you for sharing with me! This dish looks so flavorful. Love my slow cooler, but I like you, am perplexed by the unseasonably warm temperatures, even across the map. I need some snow…. Your short rib dish looks great! I’ve been thinking about cooking my Korean braised short ribs in the slow cooker, but I always end up going with the quicker stove top version. Delious and my house smelled so good all afternoon! Loved this, I followed the oven version without any changes it was perfect served it with brown basmati rice.